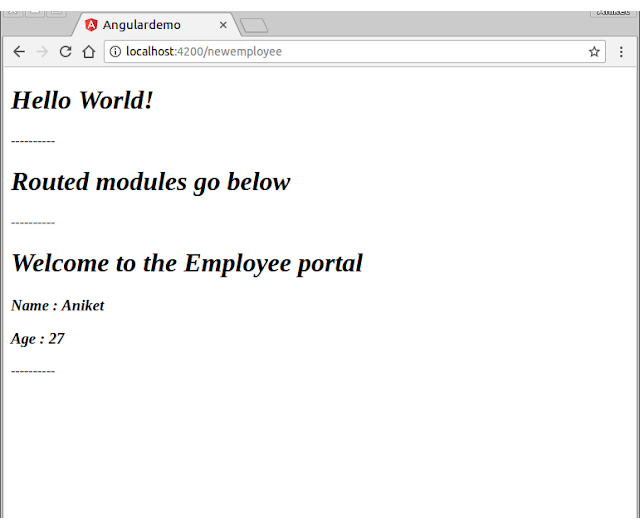 In this post, we will see how we can set up routing and navigation in Angular. If you are new to Angular please read the Hello World go through the posts above first. This post assumes you have a base project already setup as we did in the last post. src/app/app.module.ts : New Component is added to imports and declaration in the main module file. Notice how we are binding name and age variables from our typescript file. You can possibly change this values on events and the changes should immediately reflect in the rendered page. 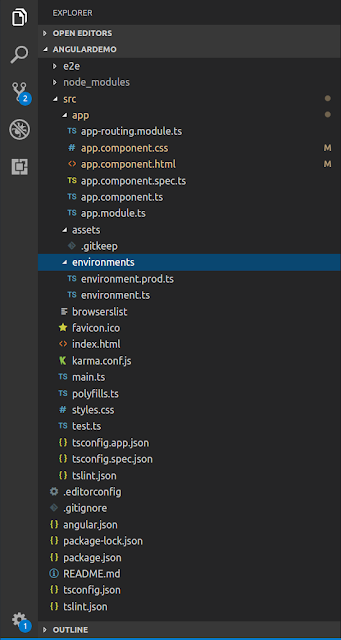 Now that we have our components HTML and typescript file ready let's do our navigation setup. 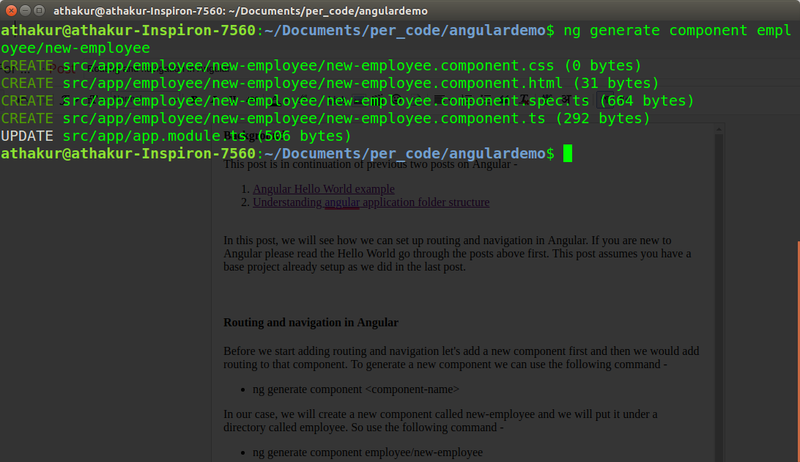 Note you can also add your custom CSS in new-employee.component.css. To add navigation we will make changes in app-routing.module.ts file. Then we have added a route for this component in the empty array the boilerplate code had. This essentially says if anyone tried to access the "/newemployee" path then use the NewEmployeeComponent and render it to the router outlet. We will come to router outlets in a moment. NewEmployeeComponent is imported and added to the declaration section. Once you have verified this, we have one last thing to do - add router outlet. 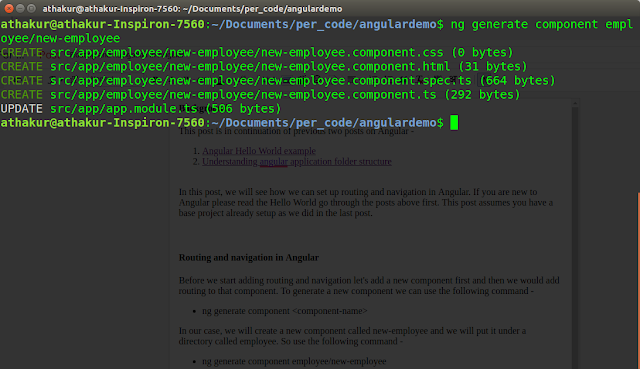 Before I proceed let me summarize the angular bootstrap process that happens. We know our configuration is in the angular.json file which points to our main file main.ts that essentially bootstraps our main module app.component.ts. The main module will try to load the root component app.component.ts that has selector app-root by default. This selector is used in our main index.html page which us again configurable from angular.json. You can also notice that default index.html file has the tag <app-root></app-root> in the body which is where our root component renders. 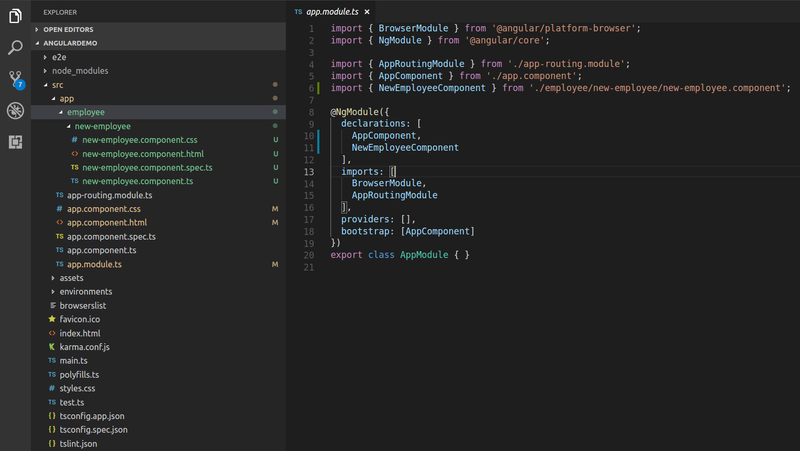 You would also see that AppComponent which is our root component is listed in the bootstrap property in the main module. You can see how our new component got rendered inside our root component. Root component generally has the layout design and based on users navigation we can render the custom component. 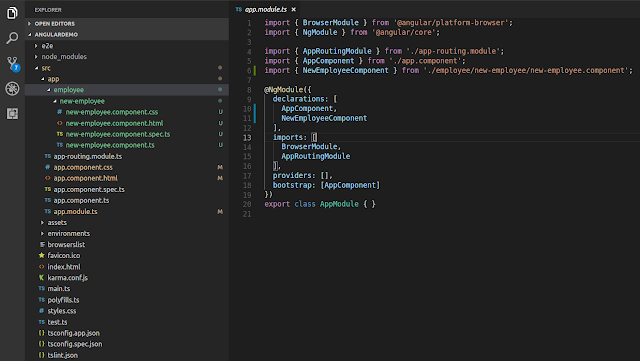 We will continue to see more angular concepts in upcoming posts. So stay tuned!